As I’m sure many of you know, I’m a big fan of well-designed things. 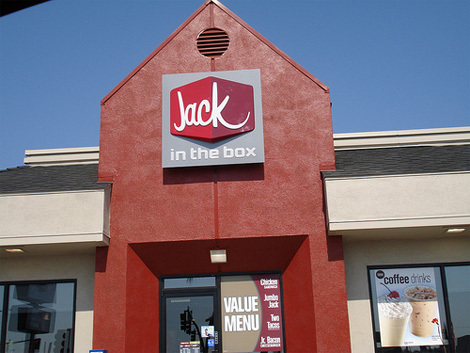 In the last few days, I’ve been looking at quite a few re-designed corporate identities, including Jack in the Box. Those of you from Utah may not be all that familiar with Jack, though it’s quite prevalent in many places on the West Coast. I myself became much better acquainted with it because of my long stay in the state of Arizona. Anyway, this is about the redesign of their logo and identity. Their original was just your basic, straightforward fast food logo. It’s got the “Here I am, look at me!” type of feel to it, if I may say so. Oh, and I seem to recall some people that I know complaining about the ‘Christian Fish’ type thing where the ‘O’ and the ‘X’ connect, though I don’t see why it was a big deal, even if it was put there to symbolize something. The new logo, however, has a very different feel to it. 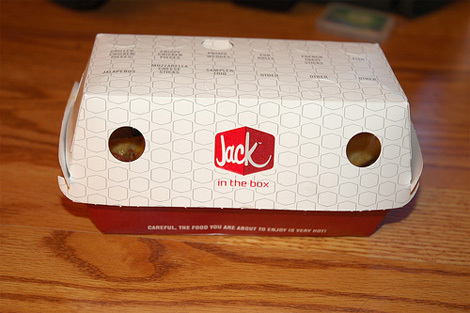 I’ll say right up front that I’m not a big fan of the huge separation between the ‘Jack’ and the ‘in the box’ part. The parts are just too distinct, I feel. They don’t tie together well. But, as to the ‘Jack’ part of the logo, I’m really a big fan. It’s got a retro, cartoon-style to it, of which I’m a huge fan. The script they used is also quite catchy. 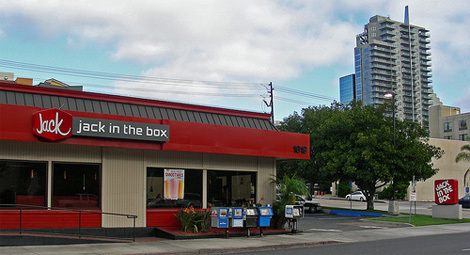 Overall, I feel that it really takes them in a different direction and separates them from other fast-food restaurants. It’s just got a really different feel to it than most fast food logos. Oh, and down below, I’m a huge fan of the all-horizontal alignment in the first picture. I think it looks very, very nice. So I went down to Hurricane last week and low and behold, a new Walmart had been built since I had visited last. But it wasn’t just any Walmart…it had a new logo! I can’t wait to hear your analysis…. I’ll see what I can do. Expect an in-depth analysis of Wal-mart’s logo coming up soon.